7.83 points at 18 votes (rank 125). 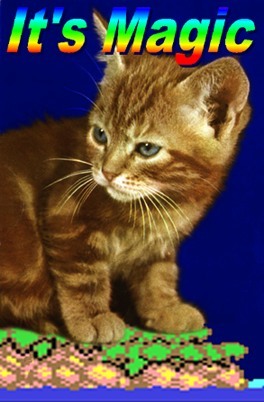 It's Magic is about the great adventure of Tommy the tomcat. He needs to go through several levels and at the same time collect diamonds. To make this not too easy, he has to deal with several enemies at the same time that aggravate his journey. However, he can defend himself against them with flashes. 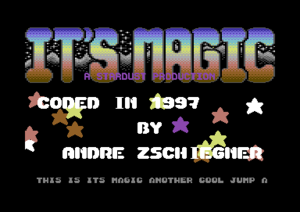 The game was directly released as freeware. In 2002 a follower was released that can be bought in the Protovision shop. The graphical design of the game is really magical. Tom is worked out in much detail and also the movements are very well done. The enemies are less detailled but this does not weigh too much. The platfoms on which Tom moves are a feast for the eyes, even though they seem to stem from the game Creatures. 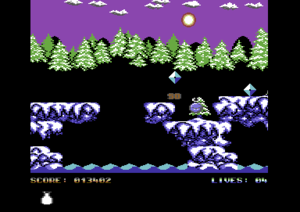 The game also offers a sightly Parallax scrolling. All in all is the graphical design very appealing although it must not count as a milestone. Especially Tom seems to have sprung from Mayhem in Monsterland, which is still more elaborately designed than It's Magic. In contrast to the graphics the sound does not offer much. 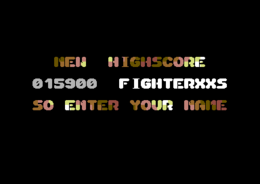 The title screen comes up with a nice piece of music while in the game only bland sounds come from the loud speakers. What a pity, because they could actually have made more of this. However, the game is still appealing without background music but it would be far nicer if it would offer at least a bit of background music. It does not derogate the fun in the game though. Each of these groups has its own design. At the end of each eighth level you need to defeat an end boss. You task is now to get Tommy safely through the groups of islands, collect every piece of the crystal and find the different magical potions that are needed for the way home. The game is controlled by joystick. 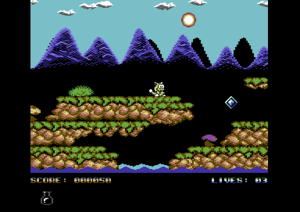 The creatures are shot with flashes which are triggered by the fire button. Some creatures need far more hits than others before they are eliminated. You jump by pressing the joystick upwards. All diamonds and the magic potion need to be collected to reach the next level. Some monsters leave behind different extras after they die. Tommy needs the magic potion to be able to end the level. Some monsters appear only when you walk back again. As long as a shot can still be seen on the screen, you cannot fire another one. H.T.W: "A graphically very well designed jump-and-run with high difficulty grade, featuring the small tomcat Tommy in the style of Giana Sisters, but does no fully reach its class." 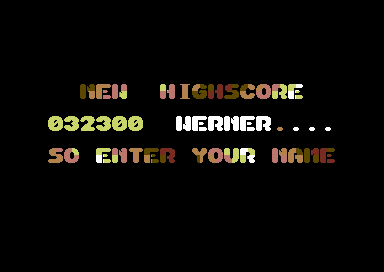 Helmutx: "A very nice jump & run after my fancy: nice graphics, moderate difficulty grade, no time pressure, highscore saver etc... The only drawback: no ingame music. 9 points! FXXS: "This is at latest after world 2 more a shooter than a jump&run a therefore it is annoying that the shooting frequency is not constant. Otherwise it is quite fun, although I would have liked some background music more than the rather average sound effects... 8 points. "